2019 Event Tickets for Miami Concerts are on sale now! Across the United States, countless music festivals unfold each year. The subtropical southern tip of Florida puts its own spin on the concept. With a party-heavy atmosphere and concrete backdrop, Miami’s is an unusual candidate for music festivals. It is a departure from camp-out festivals and tried-and-true festivals that take place in other cities. However, Miami (and the surrounding area) has developed its own collection of festivals. Some of the city’s top festivals include the following: Okeechobee Music & Arts Festival, 9 Mile Music Festival (formerly Marley Fest), Ultra Music Festival, Tortuga Music Festival, Afro Roots World Music Festival, SunFest, Rolling Loud Festival, Overtown Music & Arts Festival, III Points, and House of Creatives Music Festival. Listeners who are really interested in electronic music, club music, and island music will find plenty of concerts and festivals to meet their needs in Miami. For Concerts in Miami, please see our event listing calendar of Concert tour dates in 2019! Miami is known for its club scene and beach scene, both of which come to life with musical accompaniment. The top clubs pull in the best crowd-pleasing performers, including DJs, national acts, and local favorites. The hottest beach destinations encourage surfers and sunbathers with live music, too. Overall, Miami’s best entertainment offerings—from dancing to clubbing to surfing to drinking—are furthered by the musical arts. Just look to the vast number of establishments that bring together food, drink, dance, and more with music. For people who enjoy music but want something more to go along with it, look into the nightlife in Miami. 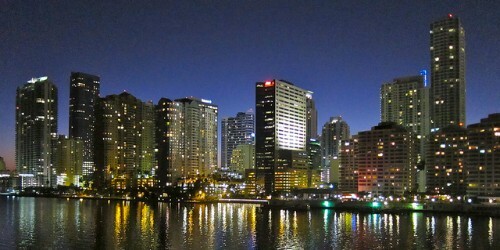 Miami is known as American’s primary connection to the Caribbean. It is home to a large Latinx population and several diverse Caribbean cultures. As many know, the Caribbean is not a uniform, monolithic place, and so the cultures of the Caribbean are not identical to one another. For Miami’s music, this means that the music scene is informed by the many differing musical traditions and takes from this part of the world. The traditions imparted by Caribbean sounds include the conga, salsa, Latin jazz, and Latin rock. These styles merged to create Miami-Caribbean music. Trumpeter Arturo Sandoval and rock band Bacilos are two examples of musicians who embodied this fusion. Today, listeners can hear these influences all around them; this rich history is heard in the instruments used, the genres created, the styles performed, and more. For those who want some hands-on learning with their live music, experience this music history through workshops such as the Drum and Dance Workshop: Colombian Rhythms held by the History Miami Museum. How Do I Find Upcoming Miami, Florida Concert Events Near Me? See below for a list of Concerts in Miami FL scheduled for 2019.